What is a Certified Speaking Professional? Employee Engagement Surveys – Why Not Do Them Live? Giving Feedback Requires Trust. No Trust, No Feedback. Emojis at Work – Do We Really Need Them? Last updated by Shari Harley at December 4, 2018 . 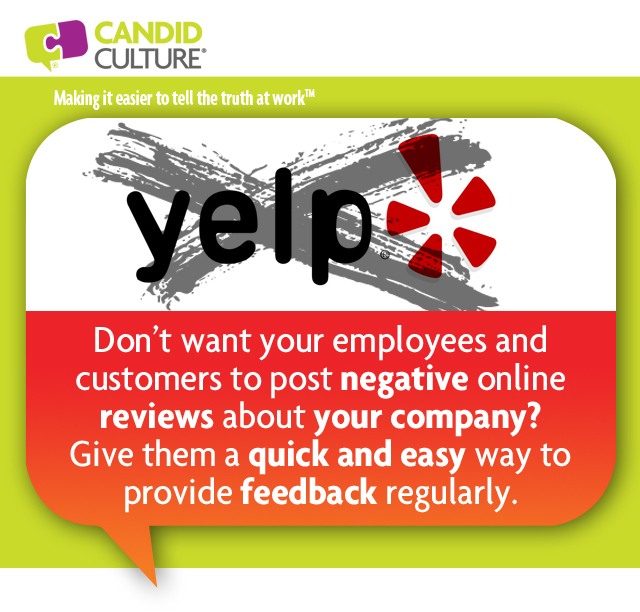 Many businesses are struggling to overcome negative and permanent online reviews on yelp, trip advisor, Glassdoor, etc. And they’re wondering why customers and employees go online vs. giving feedback directly. The answer is simple. Giving feedback online is easy. Giving feedback directly is harder, for many reasons. No one wants to be the person who complains. Feedback is likely to be received with a defensive at worst and explanatory at best response, and who really wants to deal with that? And we fear we’ll get “in trouble” for giving feedback, etc. etc. etc. I could go on and on. If you want your customers and employees to give you feedback directly instead of blasting you online when they’re unhappy, make it easy to give you feedback, regularly. Ask customers and employees for feedback regularly. Don’t wait until the end of the year or after a service has been provided to ask for feedback. Ask for feedback during the customer’s experience. Ask employees for feedback every 90-days. Marriott hotels is masterful at this. Hotel guests don’t get onto the hotel’s free Wi-Fi until answering one question about their hotel stay. If guest feedback has a negative component, a manager will call you immediately. Such smart business. If you’re going to send online surveys, keep them short. Never ask a customer more than five questions, and two is better. Ask a version of, “What are you appreciating about your experience? What could we change on your behalf?” What else do you need to know? Too many businesses send exhaustive and exhausting surveys to customers after a service has been provided. It’s rude and unrealistic to expect customers to complete 30+ survey questions. Keep it short. You’ll see better response rates. Call 10% (or fewer if you have thousands of employees and customers) and ask for feedback. It’s such a rare occurrence to receive a phone call asking for feedback, it’s an immediate loyalty and relationship builder. Don’t request a positive score on a survey. Sending a survey and asking for certain response type is a turnoff. Uber drivers who ask me to rate them a five never get that rating. The best way to get an awesome rating is to be awesome. Ask for feedback early and often, and make it easy to give. P.S. And no anonymous surveys – a topic for another day. L ots of organizations send out employee engagement surveys with the desire of improving employee engagement and retention; unfortunately they often damage both in the process. There are a few employee engagement survey pitfalls that are luckily easy to avoid. Shorter is better. I hate to say this, but no one wants to fill out your employee engagement survey. It’s time consuming, employees doubt the survey will yield results, and employees worry that their feedback isn’t really confidential. Make your employee engagement survey easy to fill out by making it short. And by short, I mean 10 questions or fewer. You’ll get a better response rate to a 10-question survey than a 65-question one. And do you really need more information than the answers to ten well-written questions? Provide employees with survey results quickly. Most organizations ask for too much information. Leaders are overwhelmed by the survey information, so they spend months and months reviewing it, while employees comment on yet another employee survey with no communication. Send out a communication sharing the top few learnings – the good and the not-so-good — within a few weeks of sending out the survey. You don’t need to take action at the same time. Simply keep employees in the loop by communicating a quick summary of what you learned. If you wait too long to share the feedback, it often never gets communicated. And the next time you send out a survey, employees will remember the absence of information and be hesitant to fill it out. Within 90-days, tell employees what you will and won’t be changing, based on the survey feedback, and tell them why. Employees don’t need or expect all of their input to be utilized. Closing the loop with clear communication about what you are and aren’t changing, and why, is often sufficient. All of that being said, I’m going to recommend you send out fewer surveys. 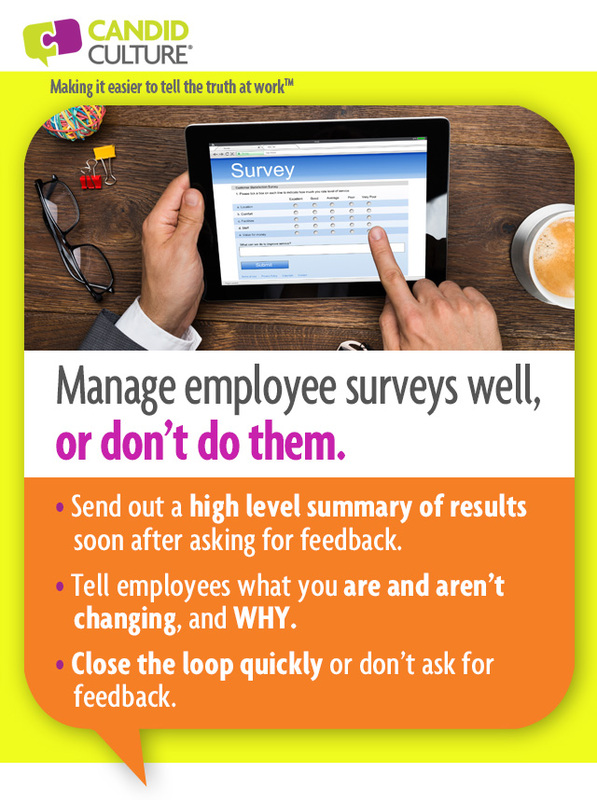 Employee engagement surveys are a good way to quickly collect lots of information. Engagement surveys are not a good way of building trust and relationships with employees, which is what leads to employee engagement and retention. Employees don’t feel closer to an organization’s leadership team after filling out an employee engagement survey. Trust isn’t built. Instead of sending out so many surveys, I’d suggest cutting the number in half and have leaders and managers hold roundtable discussions with groups of 6-8 employees a few times a year instead. Roundtable discussions achieve several goals at once—they give leaders visibility, which builds trust, they help leaders build rapport and relationships, and gather the same data that a written survey provides. When leaders participate in our Be a Best Place to Work program, we teach the five things leaders need to do to engage and retain employees. Holding roundtable discussions and asking these questions is a key recommendation of the training. Sending out written surveys is not. Engage and retain employees by talking with employees. Ask employees for their input. Listen. And watch your employee engagement survey scores sky rocket. Lots of organizations send out employee engagement surveys with the desire of improving employee engagement and retention; unfortunately they often damage both in the process. Career tips you won't get elsewhere. Sign up to get a free tip card. © 2017 Shari Harley. All rights reserved.